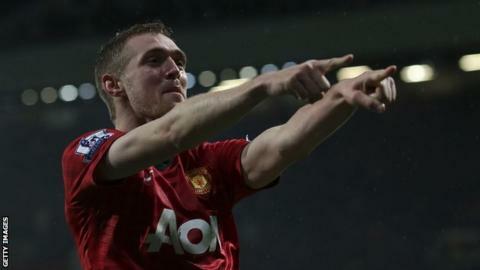 Manchester United midfielder Darren Fletcher will miss the rest of the season following surgery to resolve his chronic bowel disease. The 28-year-old Scotland captain because of ulcerative colitis but returned to make 13 appearances this season for club and country. His last appearance was on Boxing Day as an 89th-minute substitute in the 4-3 victory over Newcastle. United say the surgery was planned. A club statement read: "Darren Fletcher will be unavailable for the remainder of this season having undergone surgery to resolve his ulcerative colitis condition. "We wish to stress this was a planned procedure undertaken at the optimal time having achieved a period of sustained good general health, as illustrated by the fact that Darren has trained with the team regularly this season and been available for selection right up to the operation. "Whilst it is frustrating for both Darren and the club that he won't be able to contribute further during this campaign, this decision has been taken with our full support in the best interests of his long-term health and we look forward to him returning next season with this problem firmly behind him. "We would be grateful if his privacy could be respected at this time and in the coming months in order to aid his recuperation." New Scotland manager Gordon Strachan praised Fletcher's "commitment and pride" in playing for his country. "I'm sure I speak for all Scotland fans when I say I hope that the operation allows Darren to overcome his condition and resume his role as a major influence for club and country in his own time," he said. "In the meantime, I have stressed to him that, as captain, he remains an integral part of the international set-up and that he is welcome to join up with the squad at any time during his recovery." Fletcher, who is contracted to the Red Devils until 2015, returned to first-team football after 11 months out when he came off the bench in United's 1-0 Champions League win against Galatasaray in September. He made his Scotland comeback in the 2-1 World Cup qualifying defeat by Wales in October. However his last start was on Saturday, 1 December in their 4-3 win at Reading and since then he has made only two brief substitute appearances. Read more on What is ulcerative colitis?